Known locally for its butter burgers and frozen custards, Culvers recently opened for business in Michigan thanks to financing from EECU. Craig Culver; Ed Thelen of Commercial Alliance; Barb Smith, owner; Steve Cobb, president/CEO of EECU; Charles Canvasser, vice president of lending of EECU; Karen Richard, owner; and Timothy Walz, commercial and community services manager of EECU. 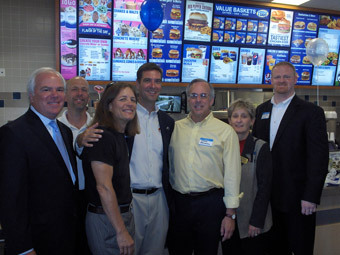 Known locally for its butter burgers and frozen custards, Culver’s recently opened for business in Michigan thanks to financing from EECU – A Community Credit Union.